Hey guys, I wrote a book. I think it’s a pretty good book. Of course, I wrote it, so I am a bit biased, but I think it’s pretty good. My mom also said it was good, but I don’t think she actually read it. My dad read it, but when I asked him what he thought, he just grunted a little and fell asleep – I wasn’t insulted – he does stuff like that. My son just said, “that book has lots of words.” He’s right, it does. I tried to show it to my dog, but he sniffed it and realized it wasn’t made of meat, so he wanted nothing more to do with it. If you want, you can buy it on Amazon.com. Here’s how it started: Way back in 2003, I was working on a draft of a play I’d written about three morons in an apartment in New York City who suddenly realized there was a bear in outside their door. A bear outside the door is not something you expect when you’re in an NYC apartment, so there were all sorts of wacky hi-jinks, because I happen to think that wacky hi-jinks are the best kind of hi-jinks. I didn’t finish the story, in fact, I set it aside for nearly a year, but that dead cowboy haunted me for a while. Not in a literal sense, there wasn’t a spurs wearing spirit sidling through my living room, but he was stuck in my head just the same. Then, like happens to folks sometimes, I realized he had a story, so I wrote it. His name was Billy Thickub. He lost his horse. Now this wasn’t just any horse, this was Old Steve, Billy’s best friend in the whole wide world. And he didn’t lose him like you might misplace our house keys or lose track of your cell phone, he lost him in the worst way. He made a bet, and he lost. Now, Billy wasn’t the sort of fellow that would lose his horse in a bet that he thought there was any real possibility of him losing. He thought for certain he’d win, because this was a bet in a spittin’ contest. Against Scoots McGinty. A sneaky, low down, snake in the grass for sure, but a sneaky, low down, snake in the grass who happened to have a spittin’ disorder so that he couldn’t muster up enough saliva to lick a stamp, let alone win a spittin’ contest. Yet, he won, Billy lost, and Old Steve was gone. Turns out, though, that Scoots was cheating, so Billy, not to take being swindled like that, tried to gather up a posse to bring down that cheat Scoots and get back Old Steve. The only problem was, Billy’s posse wasn’t much of a posse – it was just a old man named Merv who was so hard of hearing that he was more-than-half-deaf and a slow looking kid with a silly grin who never said anything but, “Sloop Sloop.” That’s not a terribly effective posse. Just the same, Billy and his new friends set off after Scoots McGinty, along the way encountering all sorts of adventures and some unusual characters like some angry Native Americans, a bunch of pickle salesmen, some gophery creatures, a misplaced buffalo, the world’s fattest cow, and the meanest outlaw in the whole west. 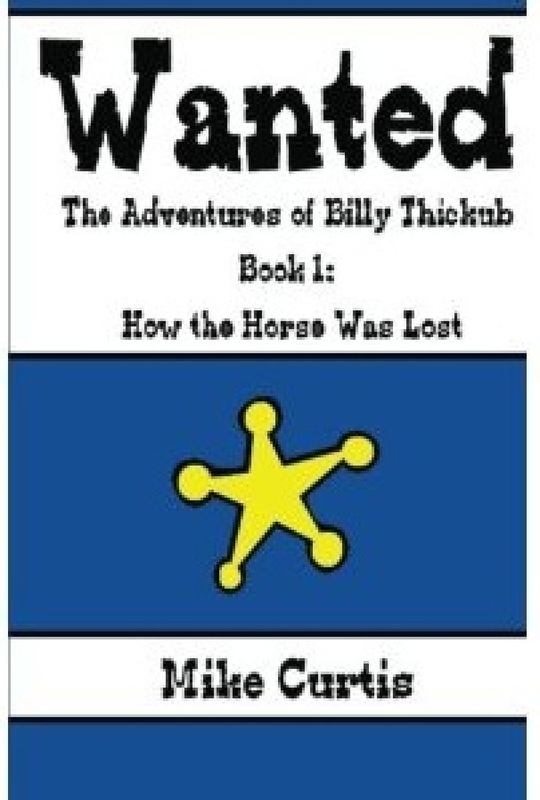 How the Horse Was Lost is just the first book in a very funny trilogy about Billy and his pals (at least it’s a trilogy in my head) written for middle grade readers. Strangely enough, it does not include that first line that I wrote – that one got deleted somewhere around the 17th or 32nd draft – it is, however, loaded with action, adventure, comedy, and more than one joke about poop. I highly recommend it, again, though, I am pretty biased. If you do happen to read it, I sure would like to hear what you think about it in the comments section below. I can’t wait until we show these projects! Because I’m baking but I’m not going to say what it is. I’m making 50 of them s we all can have two!! I don’t know if I can make double anymore because I don’t have enough ingredients but they are still delicious!!!! To bad my computer broke down my game would’ve been awesome. My painting is cool though I hope its cool enough. I was wondering if for my talking presentation could i talk about their culture instead of why you should go there? I think I did good on this project.